Divided into four parts, The Owl Was a Baker’s Daughter navigates through the mental framework of many female narrators. Although based off of the character Ophelia, I feel that this poetry collection’s audience is accessible to individuals that have not read Hamlet. The poetic form alternates at times, yet the collection feels cohesive. The lyrical nature of Cummings’s poems are like a system of rivers, beginning in different spaces full of many bends and curves, yet, somehow, flowing to the same destination. When you begin The Owl Was a Baker’s Daughter, be prepared to read it to its’ entirety during a single sitting. Cummings’s poetic flow coaxes the reader into a steady pace, reaching deeper and deeper into each musical line. at least she holds, at core, a kernel of girl. Moments like this exist throughout The Owl Was a Baker’s Daughter, leaving readers both breathless and concerned. I begin in happenstance. From whence come here and why, into arms that do not hold me, as sky in an egg births a bird and flees—…—yet heaven itself half-hatching here. I’d not be caught by desire’s wound wire, were it not my soul seeking its own death. Like many of Cummings’s poems, “Vows of heaven” catches an individual on the edge, a frame of mind pulled by both turmoil and hope, tethered by an invisible string left undefined. While exploring these minds in duress, Cummings’s poems also speak for an individual’s inner strength. Although the speakers find themselves wishing for death, they are still here. Each woman is alive to let her mind wander, regardless of the circumstances they exist under. Within this perspective, a reader is able to see a sliver of hope within the hopeless, a possibility for something new. Reading the poems this way caused me to wonder what was better: to persist and be a baker’s daughter, or reject that state and become something else entirely? 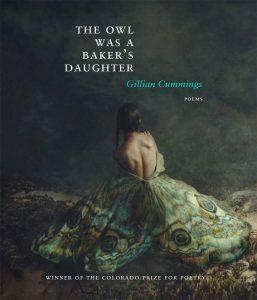 After reading each poem, I am still unsure of the answer, and I feel that is one of the best aspects of The Owl Was a Baker’s Daughter. These poems are about capturing a moment holistically. It does not concern itself with pointing out what path is necessarily right or wrong. Gillian Cummings’s writing is an undertow, pulling you into an imaginative space that is both evocative and whimsical.